Charles P. Roland, a noted historian of the Civil War and the American military, chats with well-wishers at his 100th birthday party at the Univeristy of Kentucky. He holds a cane made by one of his grandfathers for the other. 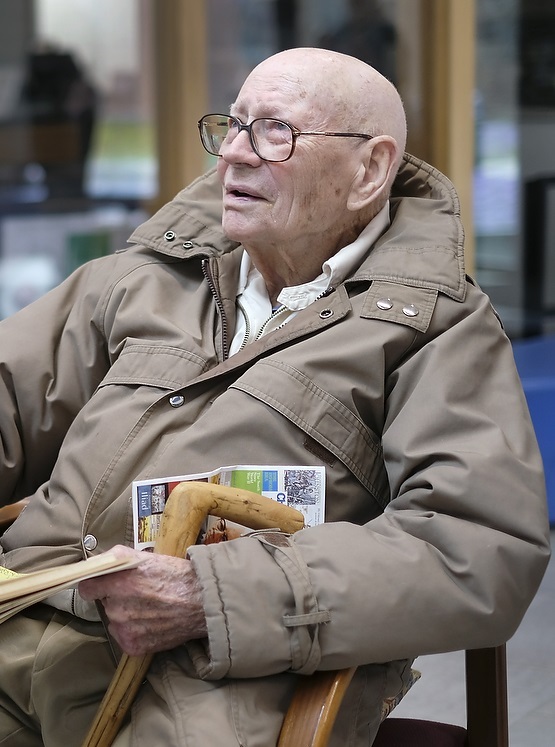 Dr. Charles P. Roland, professor emeritus at the University of Kentucky and former president of the Southern Historical Association, was celebrated last month for his 100th birthday. See the blog about him by Tom Eblen (here), and a video of the event is published on YouTube here – complete with an Army color guard. Dr. Roland’s wife, Allie Lee Roland, passed away a few days ago and the UK History Department staff wanted to alert us about the funeral arrangements. Saturday, May 5 at Clark Legacy Center, 601 E. Brandon Road, Nicholasville, KY (phone 859-271-1111). Visitation from 2-4 pm and funeral at 4 PM. We offer our condolences to Dr. Roland and his family.